Notice that it is 8 Hours Per Day! 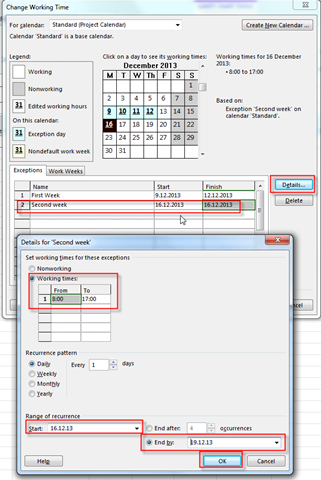 I do not have to do anything for Friday/12/13/2013, because it is already scheduled as 8 hour working day. Because I said that one day will have 8 hours for working (look at the top of this Post) the Calculation is: This Task 1 needs 10 days of duration * 8 hours per day = 80 hours. So, for completing this Task we will need to work 80 hours on it! Because John will work on Standard Calendar he will work first week from Monday to Thursday 9 hours per day (4*9=36 hours), 8 hours on Friday, which is 36+8=44 hours at First week, and Second week he will work 9 hours per day (from Monday to Thursday, 4*9=36 hours), and he will not work on Friday. Total is: 44 hours at first week + 36 hours at second week = 80 hours. 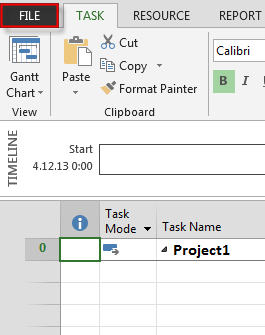 Because I said that one day will have 9 hours for working (look at the top of this Post) the Calculation is: This Task 1 needs 10 days of duration * 9 hours per day = 90 hours. So, for completing this Task we will need to work 90 hours on it! 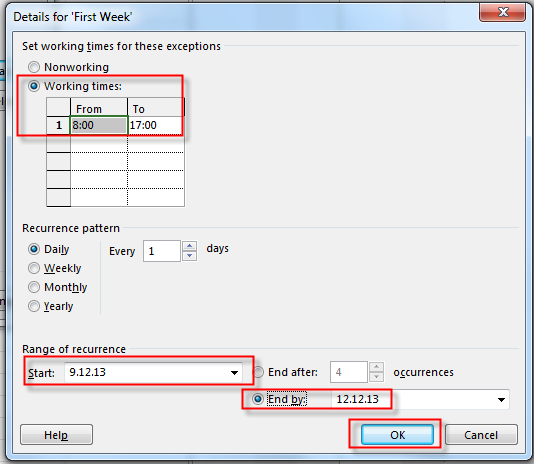 Because John will work on Standard Calendar he will work first week from Monday to Thursday 9 hours per day (4*9=36 hours), 8 hours on Friday, which is 36+8=44 hours at First week, and Second week he will work 9 hours per day (from Monday to Thursday, 4*9=36 hours), and he will not work on Friday. Total is: 44 hours at first week + 36 hours at second week = 80 hours. 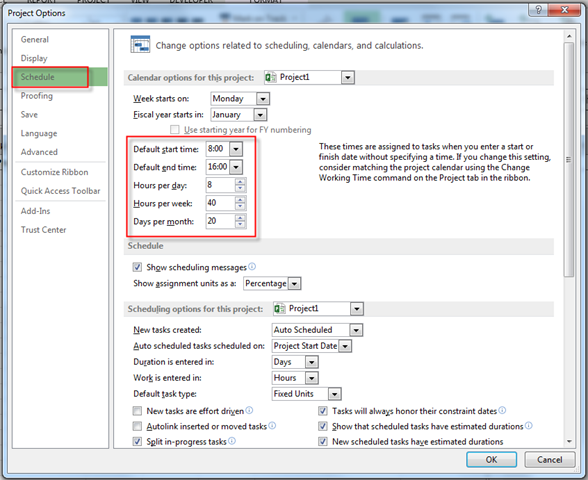 We need 10 hours more to complete this Task, So John will work 8 hours at Monday and 2 hours at Tuesday at third week. Be very careful! 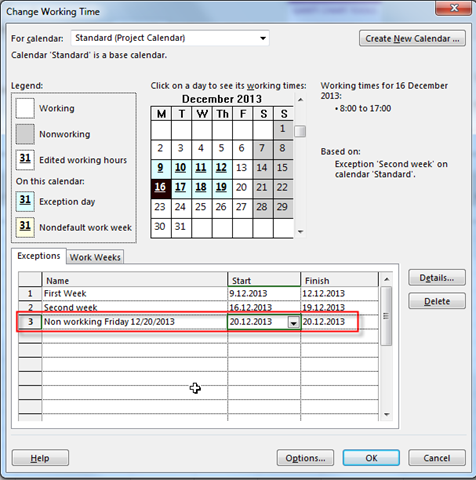 When you change working hours from 8 to 9, for example, all Tasks will be affected by that. 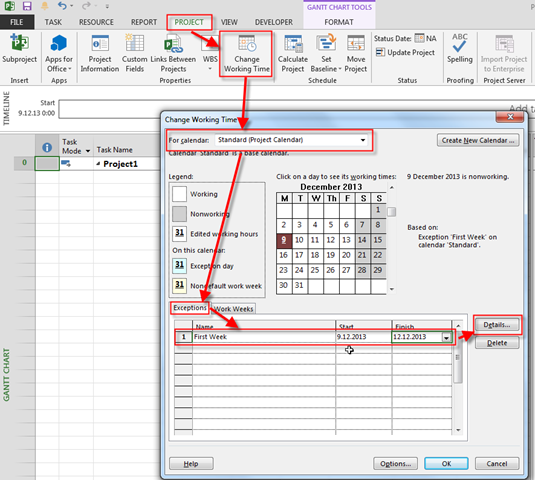 This entry was posted in MICROSOFT PROJECT, Microsoft PRoject 2010, Microsoft Project 2013, Microsoft SharePoint, PMI and tagged Microsoft Project 2010, Microsoft Project 2013 - Scheduling, MS PROJECT, ms project - scheduling, MS PROJECT 2010, MS PROJECT 2010 - Scheduling. Bookmark the permalink. 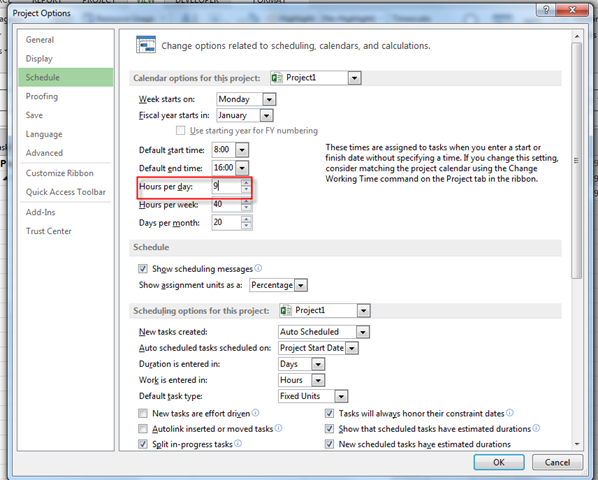 Please send me an mpp file to nenadtrajk@gmail.com and tell me which Task ID are you talking about?